(August 24, 2017) Cadence13, the leading creator of premium, on-demand audio entertainment, today announced new programming and sales leadership team members, a brand integration division, an expanded studio footprint, and a new brand identity. The company, formerly known as DGital Media, continues to grow the team and operations to keep up with the rapid pace of on-demand audio programming and audience growth. Cadence13 recently added a roster of new leadership team members, including Bill Schultz, EVP of Content Development, Serena Kodila-Regan, SVP of Programming; Rich Boerner, SVP of Programming and Operations; Chris Colbert, VP of Programming; Richard Cooke, VP of Programming; and Dave Easton, VP of Audience and Business Development. These individuals are leading the development of premium-quality audio content and audio documentaries, a new category for the company, at the company’s flagship studios in New York City, at the new Cadence13 Studios in Los Angeles and through access to studios across the country. In addition, Nick Freeman joined Cadence13 as EVP of Brand Partnerships. His responsibilities include building and leading the brand integration and sponsorship team that will work alongside and with the company’s sales team to generate additional revenue streams for the company and its partners. This includes building a bridge to web, social, and video. Formerly, Nick was at Fox Sports Digital where he was responsible for the development and execution of the digital ad sales business across all Fox Sports properties, developing the social media sales strategy that included video program development and brand integrations. The company’s new web site can be found at www.cadence13.com. 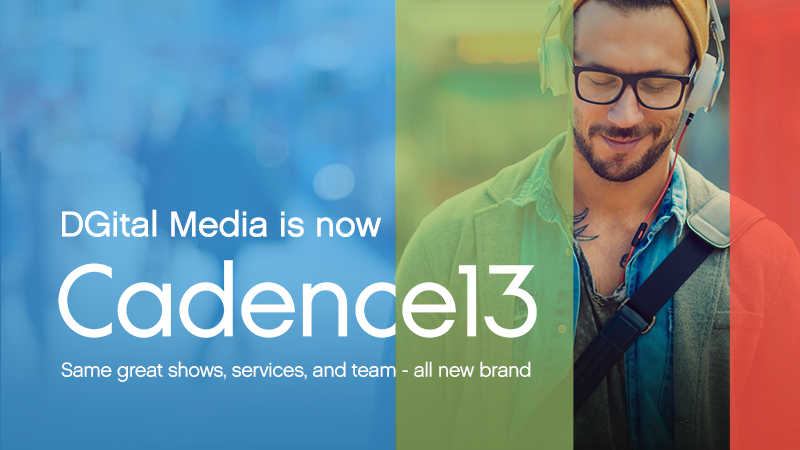 Cadence13, formerly DGital Media, is the leading creator of premium on-demand audio entertainment in sports, business, tech, politics, comedy and news. The company’s growing list of programming partners includes: Crooked Media, Eater, Entertainment Weekly, Fortune, Fox Sports Digital, Girlboss Media, IMG, Learfield, The MMQB, Mythical Entertainment, Recode, Sports Illustrated, Time Inc., The UFC, Vanity Fair, The Verge, The Vertical, Vox Media, Yahoo Sports, and Yoga Girl, among others. Cadence13 presents some of the most influential voices in sports, comedy, tech, politics, and news, including Sophia Amoruso, Nick Bilton, Rachel Brathen, Albert Breer, David Dobrik, Jon Favreau, Peter Kafka, Peter King, Ezra Klein, Tony Kornheiser, Jon Lovett, James Andrew Miller, Katie Nolan, Jim Norton, Paul Rabil, Rhett and Link, Sherrod Small, Kara Swisher, Tommy Vietor, Adrian Wojnarowski and many more. The company is headquartered in New York, with offices in Los Angeles and San Francisco.